I did make a card for Mother’s Day as well, but I’ve decided to generalise here, as it can be used for any occasion. I wanted to practice quilling some more. Here, I made a simple flower motif by combing teardrop shapes together. Next to it is a flowerbud, which is a single teardrop with a calyx v-scroll. And I added a butterfly to the scene as well. This is made with teardrop shapes, triangle shapes, and a v-scroll. The shapes themselves are not hard to make. It’s the sticking down on uncurled pieces (e.g. like the white scroll in my card) that I’m having the most problems with. But I’m sure it’ll work out. 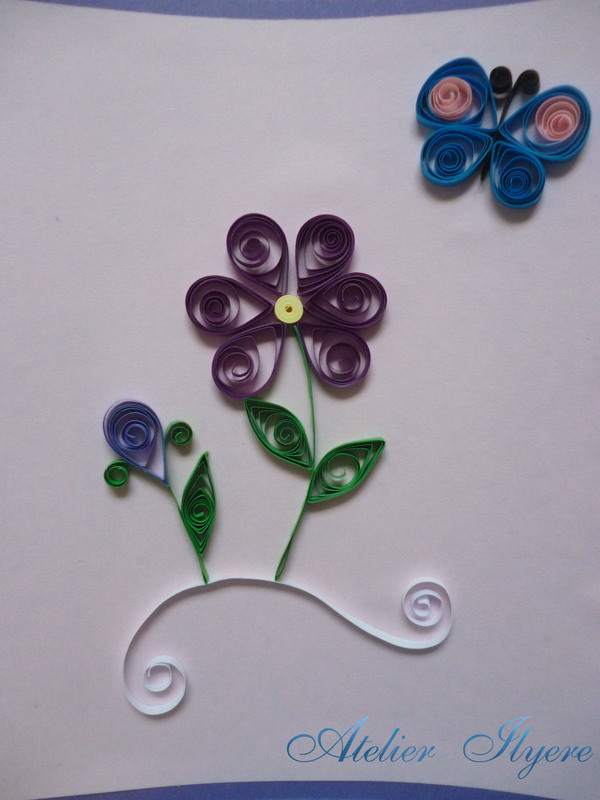 This entry was posted in Card, Cards, Paper, Papercraft and tagged Butterfly, Card, Flower, Paper, Quilling. Bookmark the permalink.